This very special offer is only available to members on this site. 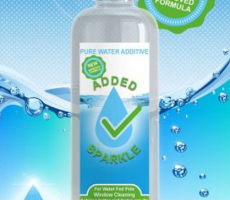 Added Sparkle has just released a new and improved version of its popular additive. Complete in 3 size bottles, applicators and full instructions. Dilute between 1 and 3 mls pre 100 ltrs of water, Added Sparkle costs pennies per day and can save you time and water along with giving the glass a great shine.